Drumming Great Lenny White Dips Into the Archives with “Lenny White Live” - One memorable night in Japan. 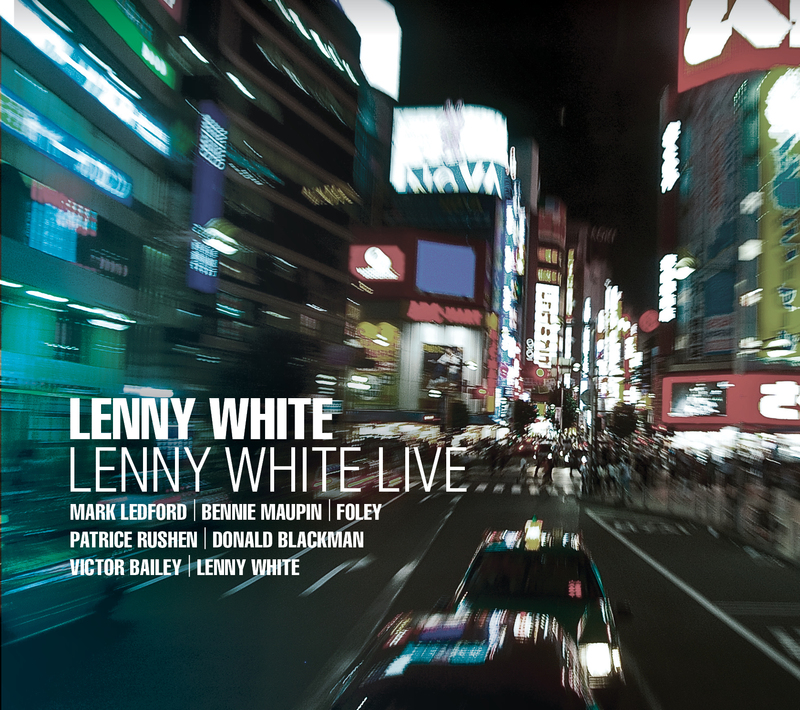 Grammy Award-winning artist Lenny White, an influential drummer and longtime member of the fusion supergroup Return To Forever as well as a prolific producer, has delved deep into his own past and come up with another gem in Lenny White Live. A document of a tour of Japan in 1997, this powerful funk-fusion outing features an all-star lineup including fellow Miles Davis alumnus Foley on lead bass along with former Weather Reporter Victor Bailey on low-end bass, former Herbie Hancock Headhunters saxophonist Bennie Maupin, the late trumpeter-vocalist Mark Ledford, pianist Patrice Rushen and Lenny’s former Twenty-nine band mate Donald Blackman on synths. Together they show remarkable chemistry on a set of originals that fuses the essence of funk, jazz, rock and soul into an organic whole. This dynamic 1997 performance comes on the heels of two highly successful studio albums – White’s 1995’s Present Tense and 1996’s Renderers of Spirit. The set kicks off with the soulful groover “Whew! What a Dream,” which is fueled by Bailey’s infectious slap bass lines and his indelible hookup with the leader’s solid backbeat. With some subtle allusions to the J.B. Horns in the riff department, this funky opener also features a potent piano solo by Rushen, who engages in some spirited exchanges with Maupin before White erupts into a whirlwind drum solo at the tag. The 20-minute tour de force, “East St. Louis” (a powerful tune from Present Tense), features Ledford on some tasty muted trumpet and is highlighted by a blistering tenor solo from Maupin, followed by another dynamic White drum solo and a distortion-laced lead bass solo from Foley. Bailey’s catchy “Pickpocket” (from Renderers of Spirit) features more tasty muted trumpet work from Ledford, who also turns in some evocative wordless vocals in tandem with Maupin’s soprano sax. White’s mysterious piece “Dark” (also from Renderers of Spirit) shifts from atmospheric synths and lyrical flugelhorn to a slamming B section that showcases Foley’s Hendrixian flights on his distortion-laced lead bass. White’s “Wolfbane” (from Present Tense) opens with a Middle Eastern-sounding motif in the horns before giving way to a turbulent tenor solo by Maupin, a prodigious piano solo by Rushen and a powerhouse Led Zeppelin-inspired throw down on the kit by White. The live outing closes with an alternate take on the opener, “Whew! What a Dream,” creating a pair of funky bookends for this one memorable night from 15 years ago. The chemistry of the band is apparent from jump, and the level of interplay remains extremely high throughout the night, resulting in some inspired solo flights by these formidable improvisers. In the best tradition of jazz, the magic happens in the moment on Lenny White Live. ""All ingredients of this style are enthusiastic present. Yet it all sounds a bit predictable way street, but Foley's solos are always an experience""
"Lenny White Live has become a sparkling registration, you can feel the musical chemistry between the band members."